In my younger, more innocent days, anyone who asked to follow me on Facebook got a little blue check mark next to “friend.” The result, years later, is a large population of numbskulls who keep me abreast of the latest paranoid nonsense. The latest item, which I’ve seen a couple of times, is a photo composite of two men. 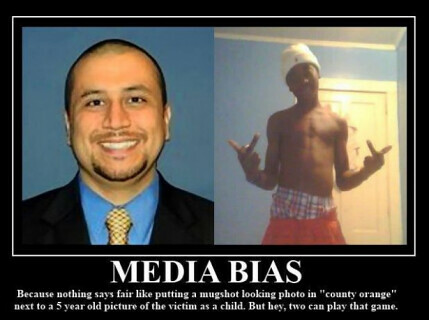 The one on the left is George Zimmerman, the man who shot Trayvon Martin, looking more put together. Who’s the man on the right? The implication: It was Trayvon Martin. The online rumor was that this photo was “pulled from Facebook.” But on Sunday, the Twitter aggregator (yes, we’ve come to that point) Twitchy, which tracks viral content, retracted a post about the photo. 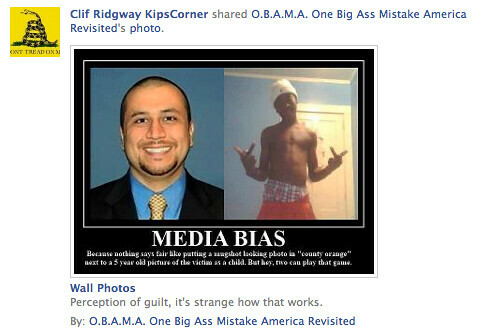 “The photo on the right is not Trayvon Martin,” editors wrote. Yesterday, I was still seeing blog posts tracking the spread of the photo. This morning, I was still getting Facebook messages about it. Why is the fake photo so popular? It’s part of a new cottage industry of “truth about Trayvon” content, calibrated to convince people that they really shouldn’t worry about the implications of this killing. Why, the kid wasn’t even a saint! He might have been shot after brawling with the man who creeply followed him around the gated community? 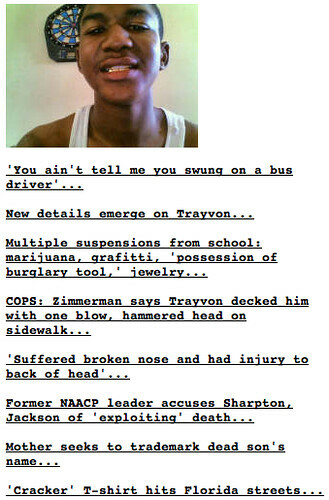 The Drudge Report has become a one-stop shop for Trayvon contrarianism. Here’s every story about the dead kid on the site right now. This isn’t too surprising; on slow news day, the site gives premium placement to stories about black youths flashmobbing and beating people up. It’s sensationalism. The defense of this coverage is that the early stories – the ones that mysteriously made the un-arrested killer of Martin come off poorly – are responsible for odious stunts like the New Black Panther Party’s “bounty” for Zimmerman and tweets about Zimmerman’s address. “It’s not the slam-dunk jaw-dropping outrage it has been portrayed as,” wrote John Hayward in Human Events yesterday, “and that portrayal has led us to a moment of anger, confusion, and incipient violence.” The implication is that more details about the case can correct that. But nothing can change the storyline like misinformation, stuff convinces the people already disinclined to worry about these sorts of crimes that they can move right on.